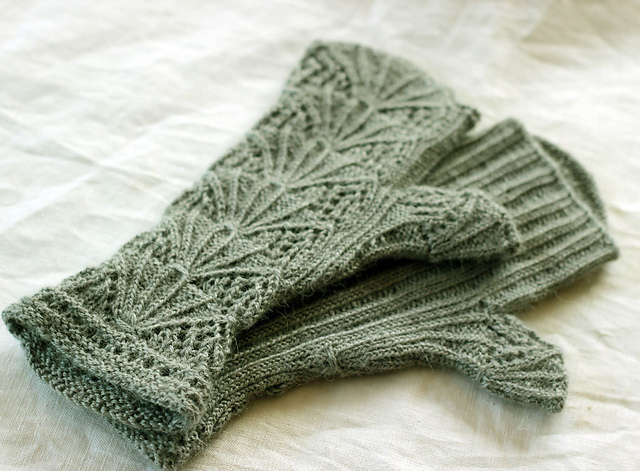 My next pick from the Ravelry Indie Designers Giftalong are the Moa Mitts by Åsa Tricosa Designs, aren’t they gorgeous. I design mostly seamless and top-down and am tempted by clever solutions. However, as I have 3 garments on the needles, one of which was started in 2013 (and I’m not even counting the hibernating Featherweight started in 2010 here) and I’m not sure if any of them will now fit – I decided against setting myself up for garment fail and decided instead to knit myself the mitts I’ve been promising myself for the last 3 winters. I have a gorgeous 1950s/1960s swing coat in a lovely heavy wool fabric that I love. The only issue is that whilst I adore the look of the 3/4 length sleeves, they can be a bit draughty. 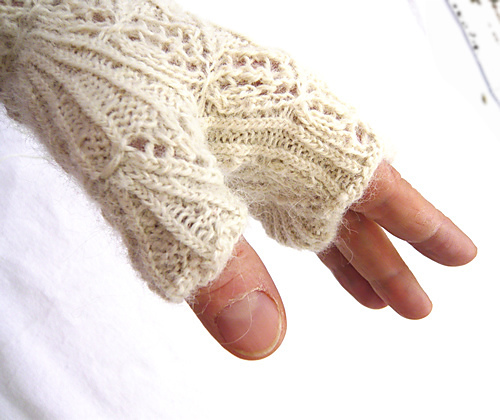 Nice long mitts are the obvious solution but I just haven’t got round to knitting them yet. Then I saw this patterns and decided that this will be the year. So what were we saying about construction? This will be the first time I’ve knit mitts starting with the thumb, yes the thumb, that bit that’s usually annoyingly last and fiddly and needs doing just at the point when really you think you are, or desperately want to be, done. This pattern also fully integrates the thumb within the overall pattern rather than having a plain thumb and all the action happening on the hand and wrist parts. Then you work the hand adding the thumb in the relevant section (following the included photo tutorial), complete the hand and work your way up the arm – genius. This pattern brings all that top down, try as you go, fabulousness to the humble, or perhaps looking at this pattern, not so humble, mitt. It also means that if I weigh my yarn and divide it in two I can keep knitting until I run out of yarn, a little gauge adjustment through changing needle size may be necessary as I work up the arm I think, but seeing as I can try them as I go, I can work that out as I go along. I’ve not decided what yarn I’m going to use yet, a bit of stash diving will be necessary – I do have a skein of Malabrigo sock in the Turner colour way that I bought to make something for myself with. I’ll need to check if the colours are tonal enough as I don’t want to lose the pattern in colour changes. Alternatively, I have some Drops Baby Alpaca Silk in medium grey bought some years ago on birthday visit to Purl City yarns in Manchester (no longer trading). This is a lovely yarn with the softness of baby alpaca and the lustre of silk and I’ve felt a bit guilty that it’s languished in the stash so long. Åsa has a great selection of patterns included in the giftalong which you can buy with a 25% discount until Friday using the code giftalong2015. If you’re feeling more ambitious than me, you could choose a garment and try the ziggurat method, or you could just be wowed by the lovely accessories included.